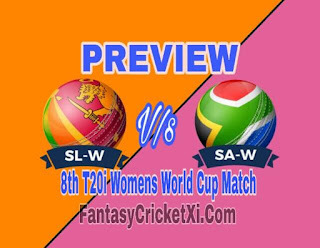 Match : SL-W V/s RSA-W, 8th Match, Group A, ICC Womens World T20 2018. Date : Tuesday, November 13, 2018. Time : 12:00 AM GMT(5:30 AM LOCAL). Venue : Daren Sammy National Cricket Stadium, Gros Islet, St Lucia. Pitch Condition : Exprcted That Pitch Will Be Supports Spin Bowlers. Avg 1st Inn Score : 154. Avg 2nd Inn Score : 148. Highest Total : 197/7 (19.5 Ov) by AUS vs PAK. Lowest Total : 105/10 (19 Ov) by WI vs AUS. Highest Chased : 197/7 (19.5 Ov) by AUS vs PAK . Lowest Defended: 150/7 (20 Ov) by WI vs PAK. SA-W 104/7 lost to 114/7 SL-W 28/03/16. SA-W 136/1 beat 132/6 SL-W 26/10/14. SA-W 77/3 beat 76 SL-W 25/10/14. 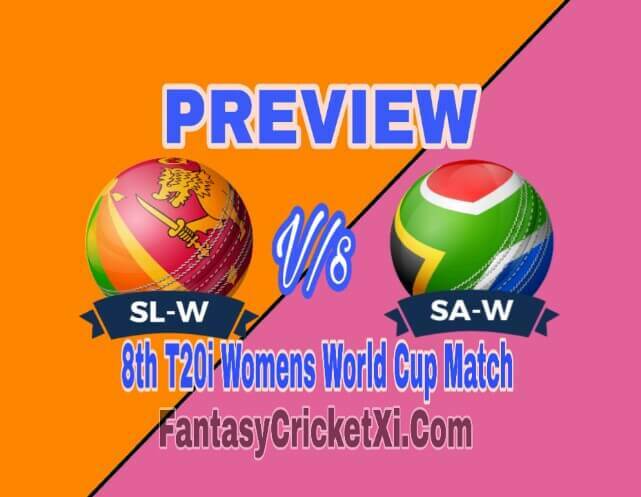 SA-W 94/6 lost to 101/7 SL-W 23/10/14. SA-W 111/5 beat 109/6 SL-W 04/11/13. Chamari Athapaththu (c), Rebeca Vandort (wk), Yasoda Mendis, Hasini Perera, Eshani Lokusuriyage, Shashikala Siriwardene, Nilakshi de Silva, Sripali Weerakkody, Kavisha Dilhari, Udeshika Prabodhani, Sugandika Kumari, Ama Kanchana, Dilani Manodara, Inoshi Priyadharshani, Oshadi Ranasinghe. Dane van Niekerk (c), Trisha Chetty (wk), Lizelle Lee, Laura Wolvaardt, Sune Luus, Chloe Tryon, Mignon du Preez, Marizanne Kapp, Masabata Klaas, Zintle Mali, Shabnim Ismail, Robyn Searle, Tumi Sekhukhune, Moseline Daniels, Yolani Fourie. ➤ They Last Match Abandoned Without A Ball Being Bowled, This 2nd Math For Them. ➤ Sri Lankan Women Did Not Won T20 World Cup Till Now.They Are Currently At No. 8 In ICC Women’s T20 Ranking. ➤ The Sri Lankan Women Players Did A Disappointing Performance In The Practice Match.They Lost Their Both Practise Matchs. ➤ SA-W Have Declared 15 Members Squad For This World Cup. ➤ This Is The 1st Match For Them In This World Cup. ➤ The South Africa Women Players Did A Disappointing Performance In The Practice Match.They Lost Their Both Practise Matchs Against Pakistan Women By 90 Runs And Australia Women By 46 Runs. ➤ South Africa Women Are Currently At No. 6 In ICC Women’s T20 Ranking.